This comes from a 2003 trip to Oregon and the Northern California Redwoods. I've always had trouble with Redwoods because they're so big and the really spectacular thing about them is the canopy at the top. Avenue of the Giants Redwoods is about 40 miles south of Eureka, California along the 101 Freeway. It's a scenic byway that runs along the freeway for about 15 miles with various Redwood Groves, such as the Garden Club of America Grove. This is the northern most point near Pepperwood. The road is paved, but I chose to make it dirt here, which gives the painting the warmth of the reddish earth tones. I like all the ferns growing along the sides, and the giant Redwood trees lining the road. This is one of the best places for looking straight down the road for a mile or so and having the giant Redwoods close in over the top. PaulB's Pointillistic/Impressionist original oil paintings of California Redwoods and various prints and poster formats of a wide variety of subject matter by the Pointillistic/Impressionist oil painter from landscape/waterscape paintings, dance, sports, portrait, to classical figures, flowers, rock and roll, Brazil, California Redwoods, and Hawaii paintings and prints are available for purchase for as little as $24.95 for an 8" x 10" matted print on photo pape. 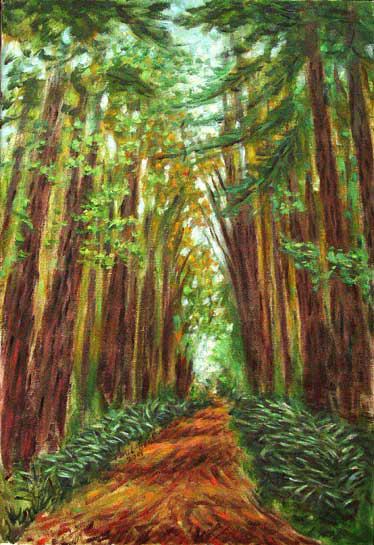 Pointillistic/Impressionist Giclee prints of California Redwoods on real canvas or heavy watercolor paper are available. One of a kind California Redwoods embellished prints, which are Giclee prints retouched in genuine oil paint by PaulB. Unless noted PaulB's original Pointillistic/Impressionist oil paintiings are oil on canvas. Paul Berenson's pointillistic/Impressionist oil paintings are in privale collections around the world, including the downtown Los Angeles Athletic Club and have appeared in numerous publications, including the New York Philharmonic Playbill. PaulB.com also builds websites and PaulB is a member of the LA Web Professionals Group.